Show up whenever doors open for set up. There’s a reason they set that time. If it’s an indoor one-table thing it might only be an hour. If it’s outdoors and you have to set up a tent and such it might be four hours. You don’t want to get things set up and find that your banner has jumped ship and you don’t have time for someone to go fetch it. Or some such malarkey. If you are confident that is too early, bring a book to read or mess around on your phone. Before the event actually starts make sure you locate (and hopefully use) the powder room, find the ATM if there is one (especially if you don’t take cards), and set yourself up with a snack and drink. I brought a ton of tools, including stuff I didn’t think I would need, so I would have stuff to try if something came up. Like binder clips to attach the banner that refused to tape up. And masking tape to hold up the tablecloth over my magazine rack. And scissors to savage a piece of floral foam that was too long. And a photo easel to prop up the lid on my display box. And bandaids to cover the craft-war-wound blister. Make sure your items are all priced. I saw one article where they have a chalkboard with a price list, so they can change prices depending on the venue and items available, and she does not have to change out tags if her prices change. Most articles said to put a tag on each and every item. One blogger used mini cards (from Moo $20+, but I think I’ll make my own for next time) for tags, which is what I would like to use in the future. Everyone said to have all of your tags in place before you head out to the craft fair. 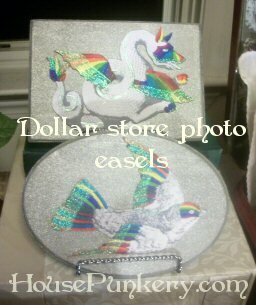 I had a price tag on each item, a 5×7 sign that had the item name, description, price, and care details, and a photo, preferably of the item in use (like for my fairy house kit, I used the photo of the assembled kit). I also had a price list taped to the front of my table, and one behind so whoever was manning my booth would have a list to consult. I got tiny tags off of eBay, since I didn’t want them to distract from my items, but found that they were too small and hard to read. I think looking back that I had an overabundance of signage. I think I might just tape my signs to the front of my table, or make a banner like my bunting. The signs are important to me but seem to take over my table. Keep in mind what is in season and appealing to your shoppers for that event. I made some buntings and doodads with summery themes, like seashells and fish. If it is a children’s festival make sure you have something that crowd will like. 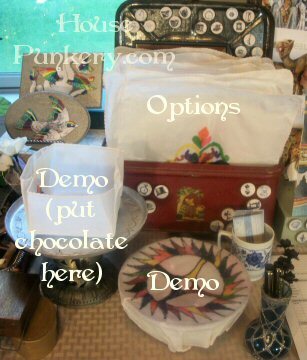 Also offer something that is not available online, so people who are familiar with your work will still feel like it’s worth it to stop by your booth and check it out. Most people say to bring three times the inventory you want to sell. This way you can fill in whatever is selling, and you won’t miss a sale. I didn’t have anywhere near this amount of inventory, there just wasn’t time to make it. I did have a bunch of a few things, and I had a couple boxes under the table of things to add in as my display depleted. Keep filling your display back in as people buy so it doesn’t look sparse. If your table looks empty people will assume you don’t have anything worth looking at. Conversely, if your table is drowning in items people won’t have time to absorb any of your items in the two seconds they take to glance, and they will pass on. When doing my mock-up I found that I had way, way too much stuff for one table. Luckily, the venue had a couple tables left and I bought another last minute. At the fair you will quickly pick up on visitor’s body language. If people are motoring through the middle of the aisle and just skimming the tables, they don’t want you to jump on them and tell them your life story. If they are slowly browsing they might like to chat or stop and look, and a “hi” would be appropriate. Almost no one made initial eye contact, since they were looking, so it’s important to evaluate body language and then be ready to make eye contact once you welcome them. My sister came and helped and showed me a lot about working with people (Did I mention how awesome my sister is?). Keeping it low-key is good, pouncing on people is bad. I do not have to struggle with this particular aspect, the pouncing is not a problem for me. Greet anyone who comes into your booth (hi, good morning, etc). We just had a line of tables so I had to decide who was actually paying attention to me, and some people weren’t, but it’s never a bad idea to say hi to someone. I also noticed that if you say hi to someone who is browsing it will almost always make them stop moving, which will buy you a couple more seconds of browsing. My sister would follow that up with, “Let me know if you have any questions.” I like this much better than, “Do you have any questions?” Which puts them on the spot, and every single time I forgot and said this I got a no. Also she was good at volunteering more information about the item people were browsing, like, “The bunting comes with an 8 foot cord to hang it.” Or, “The meal plan board comes with a week of recipes already planned, and a shopping list.” Somehow I knew I should do this, but I forgot when someone was standing in front of me. Keep your own body language in mind at all times. Be friendly and welcoming at all times. I struggle with this, I pretty much turn into a little ball in the corner in crowded places. If someone comes to browse you should stand up (casually, not shooting up like a rocket) to announce your availability to chat or answer questions. DO NOT sit with your arms crossed, or a grumpy face. You don’t have to Vaseline your teeth so you can smile the whole time, but you can hold your face just until the laugh lines crinkle, think jolly-old-elf at rest. Chocolate helps with this. If you must sit try to get a director’s chair (expensive), or WalMart has a stool that is higher than the chairs (and cheap, Amazon? has one that I think is the exact same for three times as much). My teen daughter came to help. Unfortunately, we zing each other with sarcasm constantly. I had to rein my sarcasm in for the customers, as well as control myself with her. Maybe I should make a sign –sarcasm served for free. You should never, ever bicker with someone, helping you or a customer (or use sarcasm someone could take wrong). One person said if a customer was belligerent she would never argue, she would just smile at them until they went away. I must practice this art. Practice, I will. People said to bring something to do if it is slow. But not read a book, since this will make you look unavailable. DO NOT mess with your phone (this makes me nuts). If you can make people curious about what you are making and how you do it that will help bring people in. Knitting or crocheting would be ideal, but not for me. Most of my items require wet things like paint or glue, which would not do. I brought some paper dolls to cut out, but found that I focus too hard and can’t do that and pay attention to customers. I will continue to ponder what I can bring to demo so people can see what the process is like. When there is a lull go around and check your display. Fill in any holes from items that need to be replenished, move stuff to cover something you sold out of, straighten anything that is askew, and evaluate your placement to see if you can move things to make better sales. Show off your product if you can. We wore our flower crowns. We wore clothes that fit with our items, although I would not say we were “in costume.” Display as many of your items as you can as they would be used. For my unplastic wrap I wrapped a bowl, and I made a little box for the chocolate with one of my wraps. I made a little demo fairy house for my fairy house kits. I made a display in a big frame to hang my bunting on (and will make a bunting with my name soon). 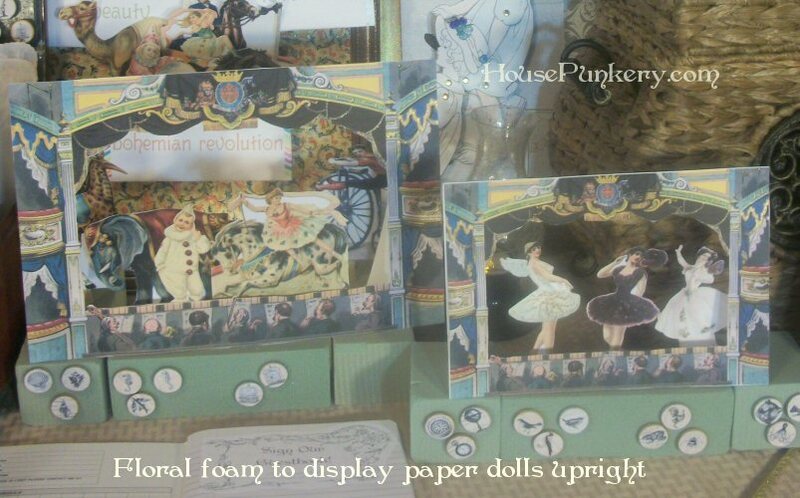 I put my paper dolls in (glittered) floral foam so they would stand up, and framed them with the little theatre I sell. Try not to get discouraged if you don’t sell well. It was rainy for the town-wide yard sale and craft fair. Of course. 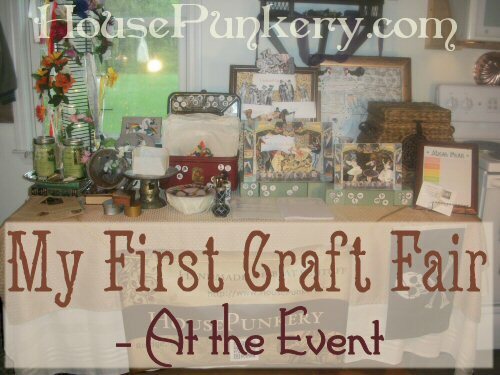 And it was the first year for the craft fair, which usually dents attendance. So sales were down, we weren’t the only ones who didn’t sell much. 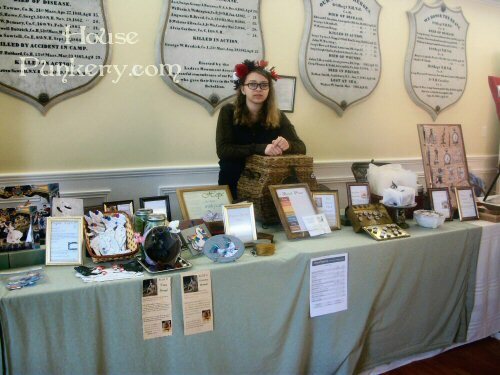 I really wanted to make enough to buy my table and chairs, and maybe even make the fee for the next fair I want to do. But I didn’t make the money and this does not mean my stuff is poop. (I tell myself again.) It just means that I had a nice, low-key craft fair to dabble my toes in. I learned a lot about what goes into it and how to sell, and how people will react to my items. And I did sell some, so it’s not all poop. 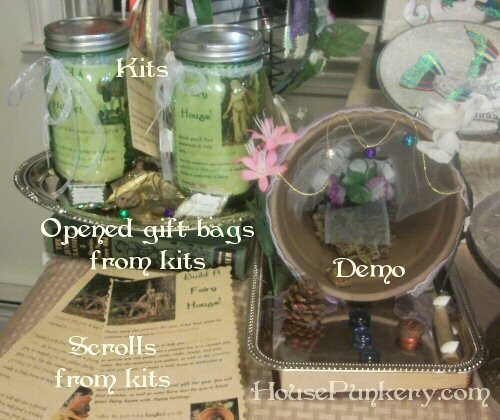 Now I can take that knowledge and apply it to my next craft fair, where I will be a super star and make zillions. 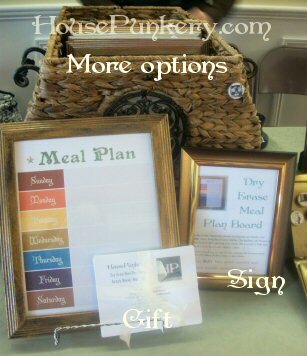 Follow Melissa French: More With Less Mom’s board Craft fair display on Pinterest. Follow Melissa French: More With Less Mom’s board Mompreneur DIY on Pinterest.